There are newer versions of this map available. To see them, view all Iraq updates. New: Improved map now includes terrain and major roads! The past four months have seen two significant victories for Iraqi government forces over the so-called "Islamic State" (ISIS/ISIL), despite floundering attempts to retake the city of Mosul. 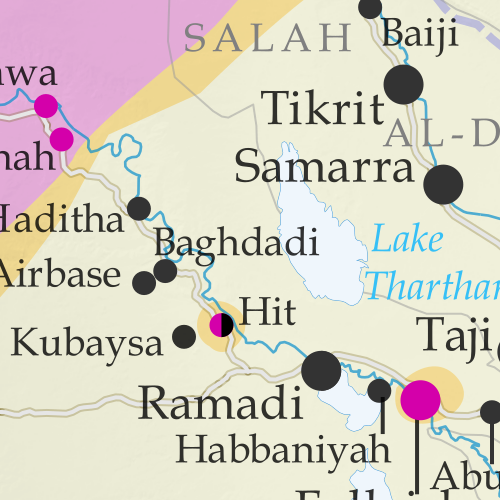 See all this and more on the latest update to PolGeoNow's concise, professional map of control in Iraq's civil war, including a timeline of changes since our previous Iraq map report in December 2015. This map and report are professional subscriber content, available to paid members or for separate purchase. Download PDF (US$14.99) New discounted price! Want to see before you buy? 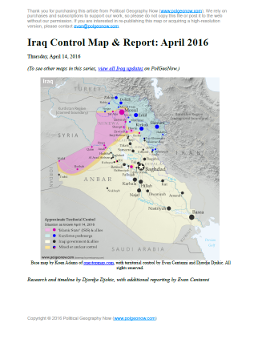 Check out our most recent FREE SAMPLE Iraq map report! Note: Republishing rights are not included with PDF purchases or basic subscriptions. If you need to use one of our maps in print or online, please contact service@polgeonow.com. Not a member yet? Click here to learn about our professional subscription service! Categories: asia, conflict zones, divided countries, iraq, isis, kurdistan, middle east, news, premium, rebel control, the "islamic state"